Trace one of your CDs onto a piece of paper and cut out. You will use this as your template. Sand the surface of each CD/DVD lightly, just enough to knock off any gloss coating. Trace the template onto a piece of felt. Cut the circle out of the felt. Repeat this process for all of the colors that you will be using for your ladybugs. Draw a curved line on your paper template for the ladybug's head (see photo). The shape will resemble a football. Cut it out and use it as a template to cut how ever many heads you need for your ladybugs using black felt. Glue the colored felt circles to the CD/DVDs, then glue the black felt head pieces on top of the colored circles. 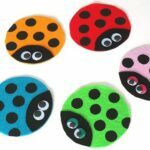 Use a round sponge applicator dipped in black paint to add spots to the colored felt on each ladybug. Glue on googly eyes to the black ladybug heads. This project for Recycled CD Ladybugs was printed from CraftsbyAmanda.com - https://craftsbyamanda.com/recycled-cd-ladybugs/ and can only be printed for education or personal use.